Residing within the FunGoPlay world are the FunGoPlay All-Stars, your friends and often times your opponents. You can get to know this characters just by exploring the world and clicking on them, but every now and then we want to take a look here on the blog. Samurai Slugger trained to be a performing martial artist in a traveling circus show. He abandoned that life and pursued competitive sports challenges instead. Sam was the best player in FGP’s Japanese League and only decided to come to the North American FunGoPlay league after being bested by Pete Bunyan in a charity lumberjacking competition. Sam isn’t very friendly to most people, but it’s only because he is so focused on living up to the expectations others have for him and he has for himself. To avoid interacting with others, he pretends to not speak English very well, but he really speaks it fluently, in fact, with a British accent. Personality: Quiet. Noble. Confident. Very focused. Skills: Superior baseball player, his sword skills also slice and dice at Wild World. 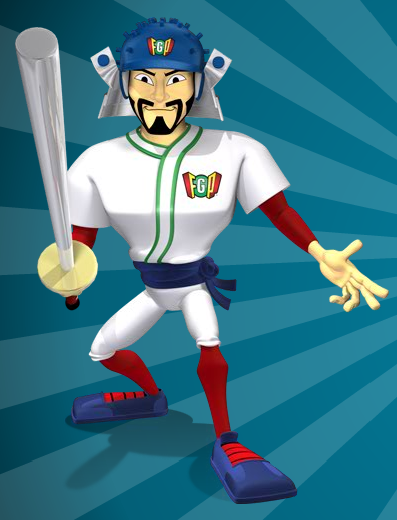 Samurai Slugger can usually be found hanging out around HurleyButt Field, he won’t mind if you stop by and say hello. Don’t forget to look out for other FunGoPlay All-Stars! Posted by fungoplay on September 21, 2011 in General.